Maria Fitzherbert was the morganatic or unofficial wife of George IV. Maria was 29 years old when they married in a secret ceremony on 15 December 1785, in Park Street, London. Maria had been twice widowed and was a Roman Catholic. The then Prince of Wales did not have his father’s permission for the marriage and so under the Royal Marriage Act of 1722, it was illegal. The Prince of Wales was later forced to distance himself from Mrs Fitzherbert and settle for an official marriage on 8th August 1795 to a woman he did not love – his cousin, Princess Caroline of Brunswick. After separating from Caroline, the Prince resumed his relationship with Maria in 1804, but they never lived together. George had Steine House, conveniently close to the Royal Pavilion, built for Maria. She died there in 1837 having survived the Prince by seven years. 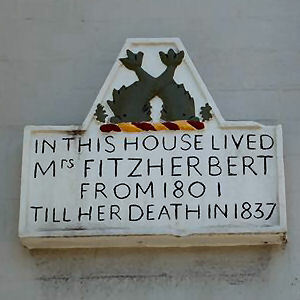 She is buried near the altar of St John the Baptist’s Catholic Church in Bristol Road (East Brighton). A Brighton urban myth (or is it?) is that a tunnel used to lead from Steine House to the Royal Pavilion for the private use of Mrs. Fitzherbert and George IV. I have been into the basement of Marlborough House (next door) and I seem to remember a tunnel entrance that was bricked up heading towards Steine House. I have looked in the basement at Steine House and have also seen a bricked up archway heading in the right direction. Today was strange – I was informed a ghost had been spotted the previous night in the basement of Steine House near to where I believe the tunnel entrance is – I asked this person to describe what they saw, and they described a woman in a large dress with hair like a judge’s wig. When I showed a picture of Maria Fitzherbert, this person was convinced it was her they had seen. I might add that this person was unaware of the history of Steine House. So this inspired conversation among those connected to the place. One person described how their wife had worked in Hanningtons (corner of East Street and North Street) and looked after the structure of the building – she had seen plans that showed a tunnel to Steine House. As this conversation ended, two strangers knocked on the door, one claiming to be a descendant of Maria and one a clairvoyant. I told them about the previous night’s sighting which made them even more excited to explore the building. The clairvoyant was feeling strange on the staircase, stating that he believed the structure must have changed and that he should really be turning. I showed him the original spiral staircase, where he took a photo of Maria’s descendant. We visited the spot of the sighting, where the clairvoyant hung a crystal and asked it questions. He believes Maria is still there, and was communicating with him, telling him that the tunnel was behind that wall. I took him to the alternate spot for the tunnel, where the clairvoyant believed he felt a male presence, and where the person whose wife saw the Hannington plans said he believed the tunnel was also. Photos were also taken on the balcony, and the site of Maria’s Chapel was also of interest to the clairvoyant. 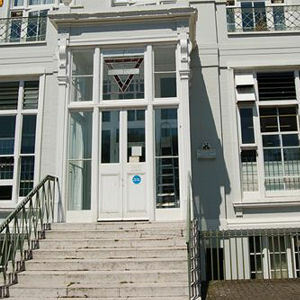 On leaving, the clairvoyant stated that he believed Mrs Fitzherbert and the Prince Regent to reside there due to having been so happy, and that their positive spirits have a positive influence for those who come to Steine House! Sorry Spooky, but I ain’t buying it. Maybe there was a ‘so called’ clairvoyant, but the belief that he/she was selling you was a myth - maybe even believed by themself. As to the tunnel it maybe an ‘urban myth’ but I’m a lot happier believing in it as it makes more sense. I’m sure that on a school trip to the Royal Pavilion, a door was said to lead to a tunnel which led to Maria Fitzherbert’s house. Whether it was true or said by the guide to make the trip more interesting for us kids, I don’t know. Why not visit the Pavilion and find out? The tunnel is there- it runs from under the Pavilion to the Dome which use to be the royal stables in one direction and to Steine House in the other direction, it is blocked under the Pavilion now because it is a very bad state of collapse, many years ago I walked along this tunnel from the Pavilion to the dome while carrying up a Health and Safety inspection when I was involved with the unions. There are also tunnels under the Corn Exchange. I heard that there is a tunnel that goes to the Royal York building which was apparently once a place where the Prince used to “frequent” with the painted ladies – if you know what I mean!